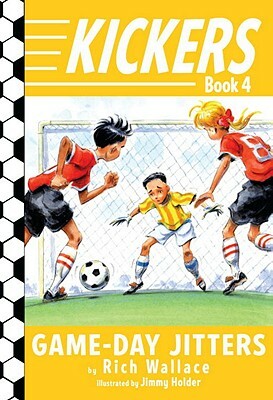 Filled with on-the-field soccer scenes, black-and-white artwork, and sports statistics throughout, this short novel—ideal for newly independent readers, athletes, and all sports fans—follows nine-year-old Ben and his fourth-grade team, the Bobcats, as they race to the Kickers League playoffs. Ben knows he's one of the team's strongest players, but he's been struggling with the jitters. He's just freezing up on the field. Can he pull through for his teammates now that they really need him? RICH WALLACE is the author of Sports Camp, Perpetual Check, One Good Punch, Shots on Goal, a Booklist Top Ten Youth Sports Book, and Wrestling Sturbridge, an ALA Top Ten Best Book for Young Adults. Visit him on the Web at RichWallaceBooks.com.